Meeting Beckham didn’t help Wozniacki as she was booted from Los Angeles by good friend Cirstea. Stosur rolled Ivanovic, the Radwanska sisters are both advancing through the tournaments like the Williams sisters should be, Pennetta bounced Petrova, Bepa’s in the QF and Safina qualified for some tournament in Doha. 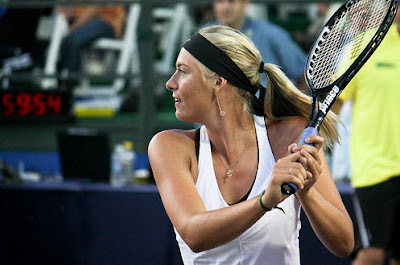 Slamin’ Sharapova took out pretender Azarenka and now Bondarenko (the Greater). It must be the headband. Baghdatis won, Lopez won, Soderling won, Haas beat Ferrero, De Chaunac upended Tursunov, Karlovic ended Devvarman’s run and Hewitt lost to Del Potro. Good to see all of the wildcards got double bagelled in the first round of the $50K Astana in Kazakhstan. Magdalena Rybarikova on the WTA site.